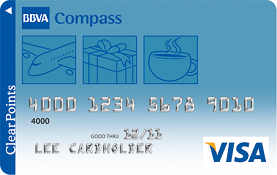 Pay NO annual fee for the BBVA Compass ClearPoints credit card and add additional authorized users at no cost. CUSTOMIZE YOUR CARD: Earn up to 3 CompassPoints for every $1 spent on categories you chose when using the card. Get up to 3X the points on gas, utilities, office supplies, etc. These points can be redeemed for account credits, retail gift cards, exciting travel options and name-brand merchandise. Select participating retailers offer higher account points than the 1%. Free Enrollment feature means as a cardholder, you are automatically enrolled as a BBVA Compass ClearPoints customer at no additional charge. Security alerts notify you of possible suspicious activity on your account, as well as convenience notices for payments, balances, special offers and more. You never pay interest if you pay your balance in full every month. If you prefer to talk to a person, account representatives are available to assist you by phone at 1-800-239-5175. The complete VISA benefit package is available here. Free Common Carrier Insurance: A full Benefit Amount of $500,000 is payable for accidental loss of life, two hands or two feet, sight of both eyes, one hand or one foot and sight of one eye, speech and hearing in both ears or any combination thereof. The Visa Auto Rental Collision Damage Waiver benefit (“Auto Rental CDW”) provides—at no additional charge—reimbursement for damage due to collision or theft up to the actual cash value of most rental vehicles, when certain terms and conditions are met.